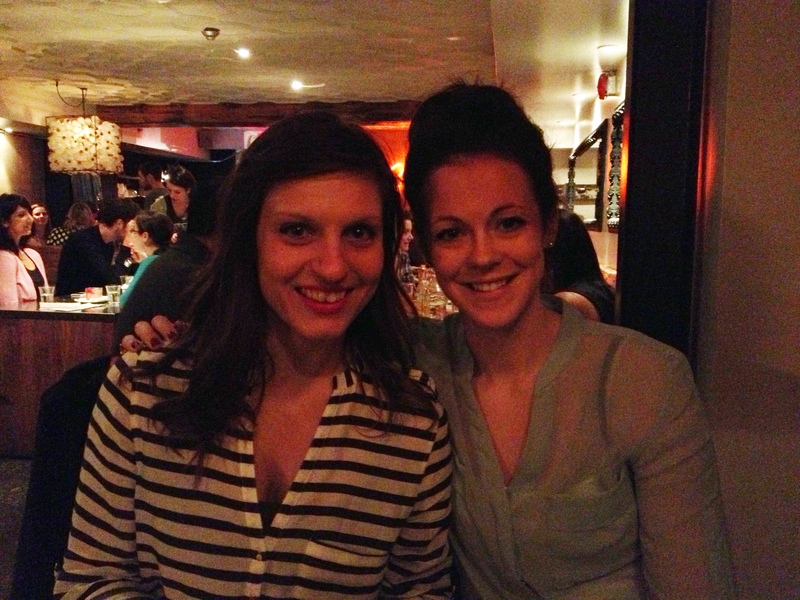 During our Spring Break eating marathon in Toronto a few months ago, Adam and I went to La Carnita with our good friends Krista and Kara. The food baby of Andrew Richmond and Amin Todai, La Carnita, once a roving pop up restaurant that featured local street art, has turned into a Mexican sensation in Little Italy. A self-proclaimed celebration of street art and street food, this hip College street restaurant is nestled amongst the plethora of restaurants that blend into Little Italy in the Toronto west end. 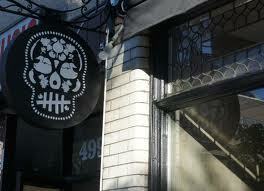 The outside of the restaurant is conservative with heritage features and black accents with only a Dios de Los Muertos inspired Skull identifying the eclectic restaurant. Inside is a very different story. The walls are covered in awesome graffiti and the street art that adorns the walls changes on a regular basis. The gritty and contemporary decor consists of a juxtaposition of new and old with its heritage architecture featured in the moulded plaster ceilings and the trendy modern details of unique industrial lighting, low wooden furniture, and colourful vintage seating. The restaurant does not take reservations, so when we entered La Carnita around 7pm on a Tuesday evening we were delighted to get a table for four right away. 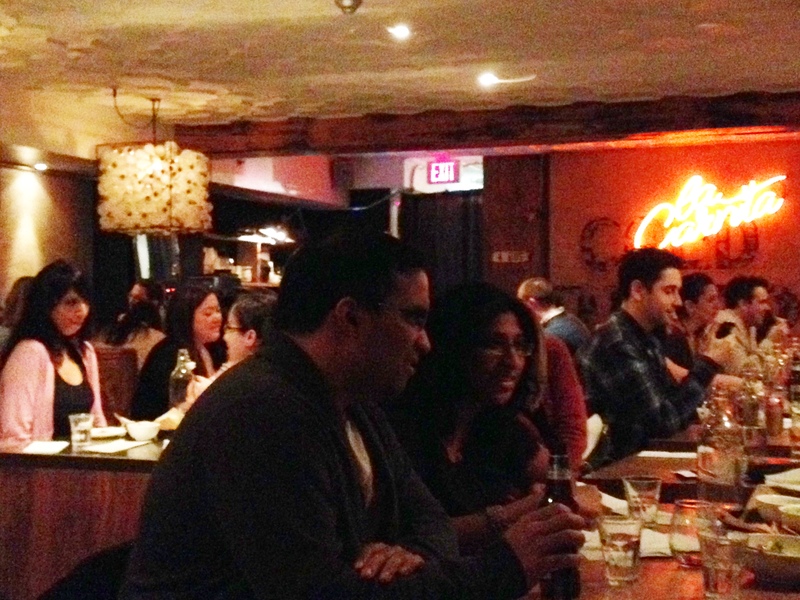 However, by 7:30 the restaurant was filled to capacity and had the ambiance of a Saturday night! The restaurant is casual, boisterous, and vibrant, full of life and loud music. This is not a place to take your grandmother, or for a first date; it is however, an awesome place to eat, drink, and get drunk. We all started off with local draft beer and perused the short but interesting menu. There are only about six tacos on the menu, but there is a wide range of ingredients, from ceviche to beef cheek and pickled red cabbage to mole sauce. 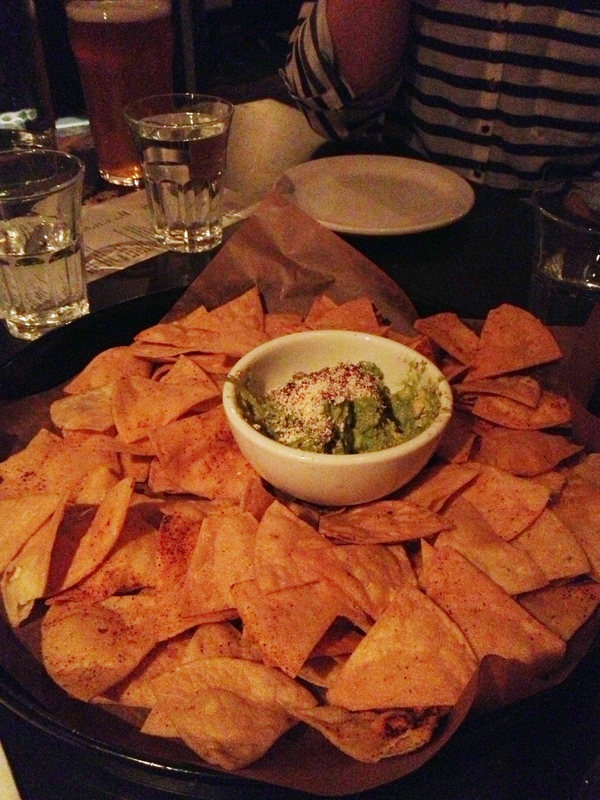 To start off, we chose to share a couple of appetizers and went with the Guacamole and Tortilla Chips with Ancho Chili Powder as well as the Choriqueso. The Guacomole was fresh and delicious and the warm chips had just enough spicy bite to compliment the coolness of the avocado in the guac. Choriqueso is also a dip starter with those yummy tortilla chips. More of a layered dip, the Choriqueso was filled with frijoles (beans), chorizo sausage, and salsa fresca with melted oaxaca and cotija cheeses. It was amazing!! The gooey layers combined to make an delicious flavour explosion in your mouth, and once again the tortillas were an awesome spicy vessel for the dip. And then came the tacos. Oh dios mio, the tacos. Between the four of us I think we ordered at least one of every taco on the menu. They all came out four at once on these huge paper lined platters and were presented open faced to show off all the fresh and delicious looking ingredients. 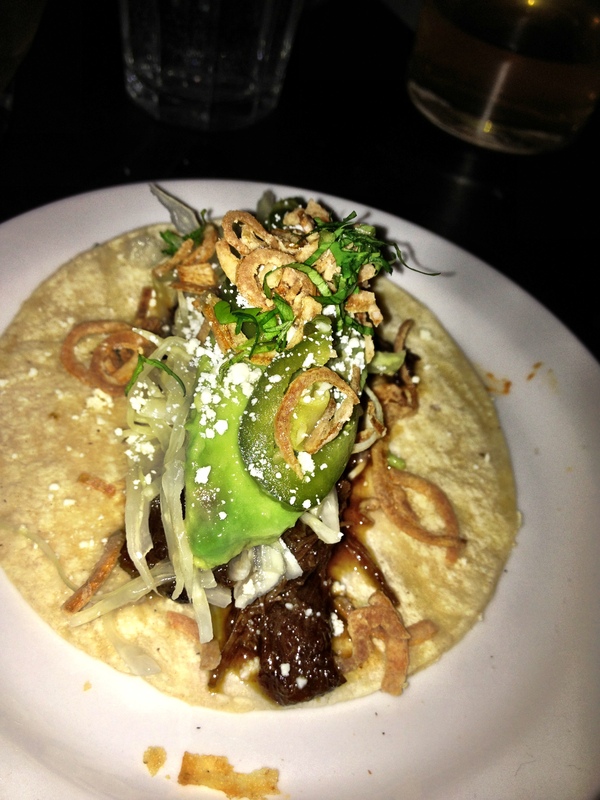 My first taco was the Beef Cheek, which had Ancho braised beef cheek, lime avocado, green cabbage, pickled jalapeño and crispy shallots to top it off. It was spicy. Really spicy. I consider myself to be pretty tough when it comes to spicy food, but wow, it was intense. Luckily it was more of the aftertaste spicyness, so I was still able to enjoy the flavours of the beef, with the help of a lot of water! Adam also had the Beef cheek which he loved, but didn’t find as hot as me, (apparently his taste buds are not as acute as mine), and his second was the Calamari taco, which was the feature that particular evening and he loved it! I rounded out the meal with the ‘Pollo Frito’ with peanut mole sauce, pickled green cabbage, and salsa fresca. I love mole sauce, and this taco didn’t let me down, it was great! Kara’s favourite taco that evening was the ‘Crispy Avocado & Frijoles’ that had beans, crispy avocado, chipotle sauce, queso fresco & cilantro. She also had the swordfish ceviche like Krista, and wasn’t a fan either; she found the crispy shell of the taco took away from the experience and much preferred the avocado one! 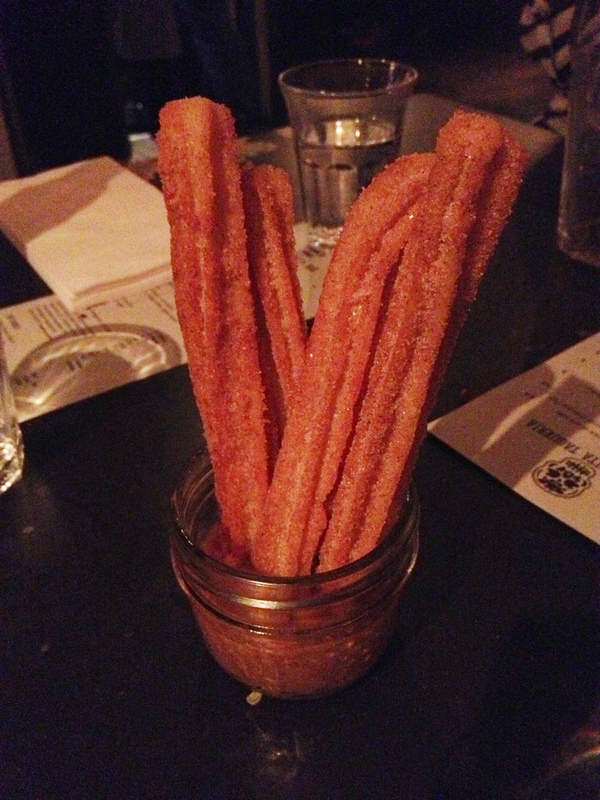 To finish off the evening, we split the Churros for dessert. The homemade Cajeta sauce, which is a caramelized goat’s milk syrup, was perfect with the brown sugar Churros and made for the ideal sweet treat at the end of a spicy meal! 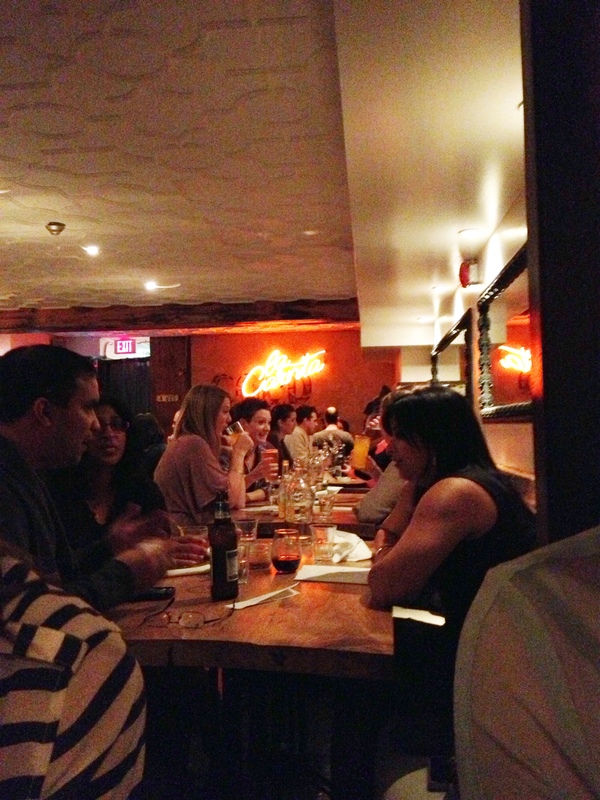 I will say that the only slightly negative aspect of our experience at La Carnita was the service. Though we got everything we needed and the server was friendly, the laissez faire, too cool attitude of the service was a little off putting, and can be intimidating to some. The four of us are relatively easy going and were pretty indifferent to it, but I think it can turn some people off sometimes. 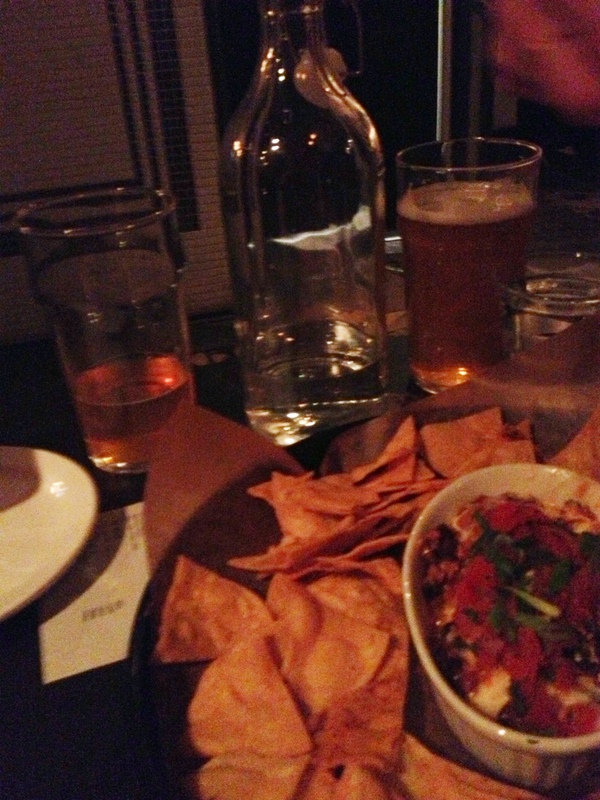 Overall though, the experience at La Carnita was great. The atmosphere was fun and vivacious. The dark and trendy restaurant is a great spot to party with friends, and a place to enjoy innovative Mexican food and experience some awesome street and pop art! Cost: 95$ for Two people including tax and tip. Keep in mind this includes numerous rounds of beer, starters, tacos, and dessert. 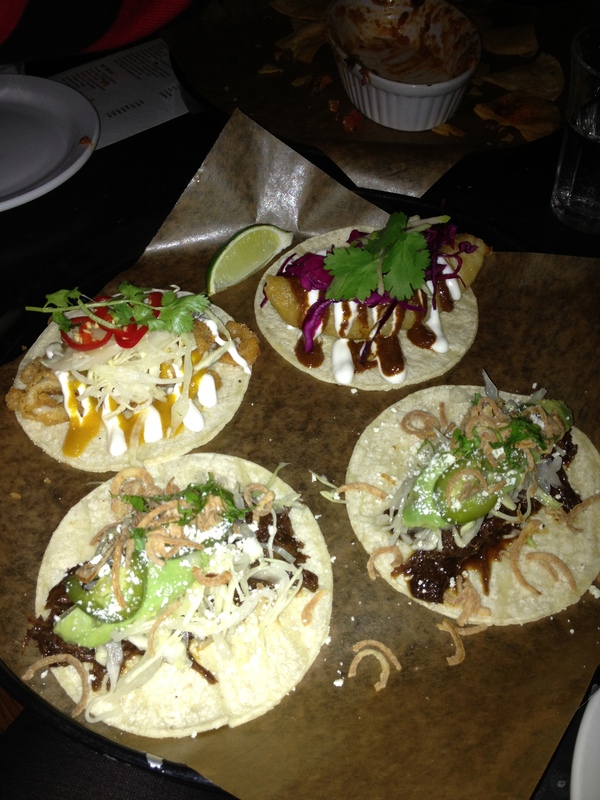 The tacos actually range from 5-6$ and the starters at 6-9$!! Things I liked: The tacos, the music, and the awesome atmosphere. Things I didn’t: The average service. The best place to sit: Anywhere really, but try to avoid the small wooden stools if you can, they are hard on the tucas. What to order next time: The Rice and Corn Frituras, they looked amazing!